I recently read a book called Snowflake Seashell Star: Colouring Adventures in Numberland by Alex Bellos and Edmund Harris which is full of mathematical patterns to be coloured. All images are truly appealing and cause attraction to anyone who look at them, independently of their age, gender, education or political orientation. This book demonstrates how maths are an astonishing way to reach beauty. There is a package called sudoku that generates sudokus (of course!). I use it to obtain the first solved sudoku which forms the base. Subsequent sudokus are obtained from this one doing two operations: interchanging groups of columns first (there are three groups: columns 1 to 3, 4 to 6 and 7 to 9) and interchanging columns within each group then. You can find the code here: do you own colored n-dokus! Sometimes I dream awake and imagine I am a famous musician. I fantasize being Paco de Lucía playing Mi niño Curro alone on the stage, Thom Yorke singing Fake plastic trees at Glastombury or Noel Gallagher singing Don’t look back in anger for a devoted crowd. My parents gave me the opportunity to learn music, and this has been one of the best gifts I have received ever. I played the cello intensively until I had children but I still have enough skills to play some pieces. One of that is the Prelude of Suite No. 1 of J. S. Bach. It is very close to the limit of my possibilities but I love it. It is timeless, thrilling, provocative and elegant: an absolute masterpiece. I also imagine myself often playing it as well as my admired Yo-Yo Ma does. So two parents give birth to two children for the next generation. The last thing to do is mutate children. Once again, mutation is not always applied since it depends on a rate, usually small. Mutation introduces some new notes (new genetic material) to the next population. It increases convergence speed and reduces the probability to obtain a local optimum. To understand how enormous is, let’s suppose we could work with Sunway TaihuLight, the fastest supercomputer in the world nowadays. This monster can do 93.000.000.000.000.000 floating-point operations per second so it will expend more than 214.995.831.974.513.789.322.026.202.008 years to calculate the fitness of all possible melodies: brute force is not an option. This experiment was inspired by The Computational Beauty of Nature, a splendid book by Gary William Flake I strongly recommend you. Two people have left traces of their own blood at the scene of a crime. A suspect, Oliver, is tested and found to have type ‘O’ blood. The blood groups of the two traces are found to be of type ‘O’ (a common type in the local population, having frequency 60%) and of type ‘AB’ (a rare type, with frequency 1%). Do these data give evidence in favor of the proposition that Oliver was one of the people who left blood at the scene? The term on the left is the ratio of the posteriors and prior odds. The term on the right is the likelihood ratio, also called the Bayes factor. If it is greater than 1, that means that the data were more likely under A than under B. And since the odds ratio is also greater than 1, that means that the odds are greater, in light of the data, than they were before. If the Bayes factor is less than 1, that means the data were less likely under A than under B, so th odds in favor of A go down. Let’s go back to our initial problem. If Oliver left his blood at the crime scene, the probability of the data is just the probability that a random member of the population has type ‘AB’ blood, which is 1%. If Oliver did not leave blood at the scene, what is the the chance of finding two people, one with type ‘O’ and one with type ‘AB’? There are two ways it might happen: the first person we choose might have type ‘O’ and the second ‘AB’, or the other way around. So the probability in this case is 2(0.6)(0.01)=1.2%. Dividing probabilities of both scenarios we obtain a Bayes factor of 0.83, and we conclude that the blood data is evidence against Oliver’s guilt. How different is the distribution of blood types between countries! It is quite easy to calculate the probability of obtaining the same number of heads and tails when tossing a coin N times, and N is even. There are possible outcomes and only are favorable so the exact probability is the quotient of these numbers (# of favorable divided by # of possible). James Stirling published this amazing formula in 1730. It simplifies the calculus to the extreme and also gives a quick way to obtain the answer to a very interesting question: how many tosses are needed to be sure that the probability of obtaining the same number of heads and tails is under any given threshold? Just solve the formula for N and you will obtain the answer. And, also, the formula is another example of the presence of in the most unexpected places, as happens here. Just another thing: the more I use highcharter package the more I like it. Imagine you toss a coin 12 times and you count how many heads and tails you are obtaining after each throwing (the coin is equilibrated so the probability of head or tail is the same). At some point, it can happen that number of heads and number of tails are the same. For example, if you obtain the sequence T-H-T-T-H-T-H-H-T-T-H-H, after the second throwing, number of heads is equal to number of tails (and both equal to one). It happens again after the 8th throwing and after last one. In this example, the last throwing where equallity occurs is the number 12. Obviously, equallity can only be observed in even throwings. The least likely throwing to obtain the last equality is the central one. As a corollary, the most likely is not obtaining any equality (number of heads never are the same than number of tails) or obtaining last equality in the last throwing: two extremely different scenarios with the same chances to be observed. Behind the simplicity of tossing coins there is a beautiful universe of mathematical surprises. The dark points are much more ordered in the first plot. The second one is more noisy. This is my particular tribute to Stanislaw Ulam and its spiral: one of the most amazing fruits of boredom in the history of mathematics. I read recently this amazing book, where I discovered that we (humans) are not capable of generating random sequences of numbers by ourselves when we play lottery. John Haigh demonstrates this fact analyzing a sample of 282 raffles of 6/49 UK Lotto. Once I read this, I decided to prove if this disability is property only of British population or if it is shared with Spanish people as well. I am Spanish, so this experiment can bring painful results to myself, but here I come. As you can see, one ticket gives the chance to do 8 bets. Each bet consists on 6 numbers between 1 and 49 to be chosen in a grid of 10 rows by 5 columns. People tend to choose separate numbers because we think that they are more likely to come up than combinations with some consecutive numbers. We think we have more chances to get rich choosing 4-12-23-25-31-43 rather than 3-17-18-19-32-33, for instance. To be honest, I should recognize I am one of these persons. 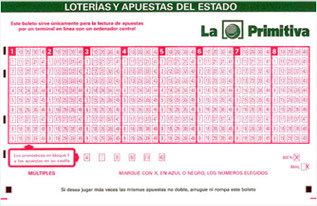 Primitiva lotto is managed by Sociedad Estatal Loterías y Apuestas del Estado, a public business entity belonging to the Spanish Ministry of Finance and Public Administrations. They know what people choose and they could do this experiment more exactly than me. They could analyze just human bets (those made by players by themselves) and discard machine ones (those made automatically by vending machines) but anyway it is possible to confirm the previous thesis with some public data. There are 214 raffles without consecutive with 294 winners while the expected number of them was 219. In other words, a winner of a non-consecutive-raffle must share the prize with a 33% of some other person. On the other hand, the number of observed winners of a raffle with consecutive numbers 17% lower than the expected one. Simple and conclusive. Spanish are like British, at least in what concerns to this particular issue. It seems that blue numbers are concentrated on the right side of the grid. Do we prefer small numbers rather than big ones? 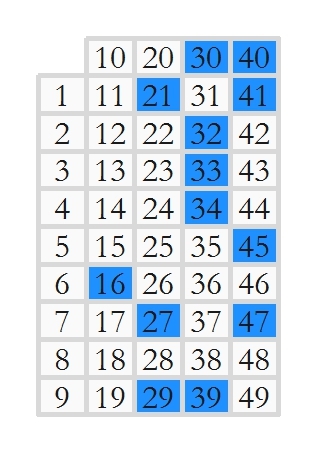 There are 15 primes between 1 and 49 (rate: 30%) but only 3 primes between blue numbers (rate: 23%). Are we attracted by primes? Now, winning combinations with some consecutive and some blue numbers present 20% less of observed winners than expected. After this, which combination would you choose for your next bet? 27-35-36-41-44-45 or 2-6-13-15-26-28? I would choose the first one. Both of them have the same probability to come up, but probably you will become richer with the first one if it happens. How Big Is The Vatican City? One way to calculate approximately the area of some place is to circumscribe it into a polygon of which you know its area. After that, generate coordinates inside the polygon and count how many of them fall into the place. The percentage of coordinates inside the place by the area of the polygon is an approximation of the desired area. I applied this technique to calculate the area of the Vatican City. 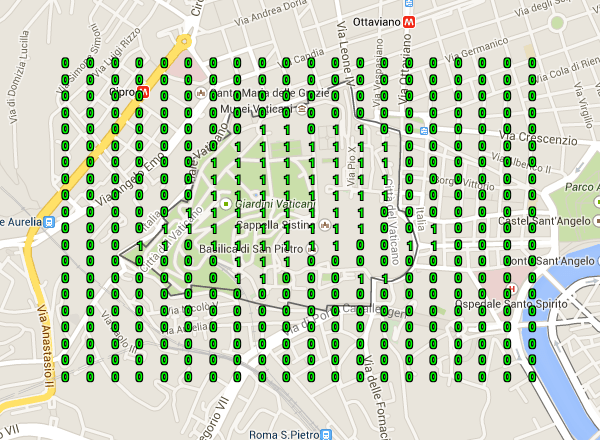 I generated a squared grid of coordinates around the Capella Sistina (located inside the Vatican City). To calculate the area I easily obtain the convex hull polygon of the coordinates using chull function of grDevices package. Then, I calculate the area of the polygon using areaPolygon function of geosphere package. To obtain how many coordinates of the grid fall inside the Vatican City, I use revgeocode function of ggmap package (I love this function). For me, one coordinate is inside the Vatican City if its related address contains the words “Vatican City”. This plot shows which addresses of the grid fall inside the Vatican City (ones) and which of them do not fall inside (zeros). As you can see, there is a big zone in the South, and a smaller one in the North of the city where reverse geocode do not return “Vatican City” addresses. Maybe Pope Francis should phone Larry Page and Sergey Brin to claim this 27% of his wonderful country. Inner curves are noisy. The greater is the distance from the edge, the higher the entropy. When I was a child, I used to play a game called the broken telephone; I can see some kind of connection between this graphic and the game. I have read that using eval+parse in sympton of being a bad programmer. 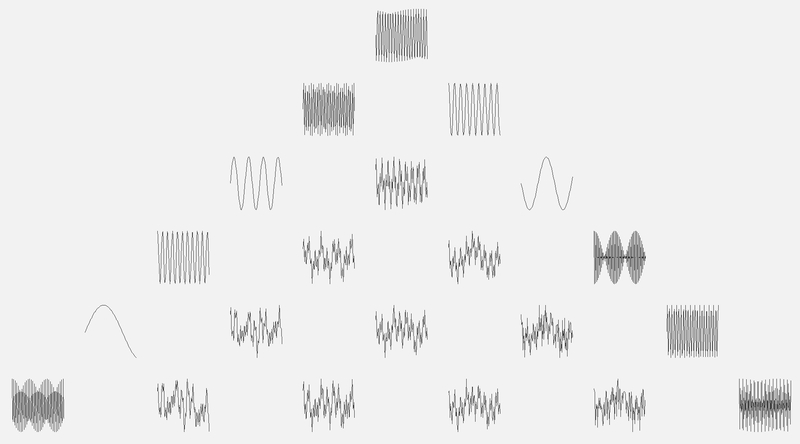 Does anyone have an idea to do this in some other way without filling the screen of code? Sarah is a brilliant 39 years old mathematician living in Massachusetts. She lives alone and has dedicated her whole life to study. She has realized lately that theorems and books no longer satisfy her. Sarah has realized that needs to find love. To find the love of her life, Sarah joined Match.com to try to have a date with a man every week for a year (52 dates in total). She has her own method to rate each man according his sympathy, his physical appearance, his punctuality, his conversation and his hobbies. This method allows her to compare candidates with each other. Sarah wants to choose the top-scored man but she is afraid to waste time. If she waits until having all the dates, it could be too late to call back the best candidate, especially if he was one of the first dates. So she wants to be agile and decide inmediately. Her plan is as follows: she will start having some dates only to assess the candidates and after this period, she will try to win over the first man better than any of the first candidates, according her scoring. But, how many men should discard to maximize the probability of choosing the top-scored one? Discarding just one, probability of having a date with a better man in the next date is very high. But probably he will not be the man she is looking for. 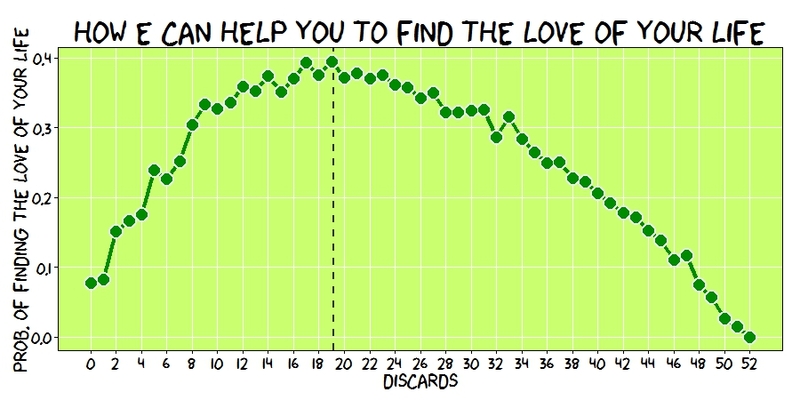 On the other hand, discarding many men makes very probable discarding also the top-scored one. Why 19? Because 19 is approximately 52/e. This is one of the rare places where can found the number e. You can see an explanation of the phenomenon here. Note: This is just a story to illustrate the secretary problem without repeating the original argument of the problem. My apologies if I cause offense to someone. This is a blog about mathematics and R and this is the way as must be understood.